Run your TestUnit, RSpec and Cucumber ruby test files from within Atom. 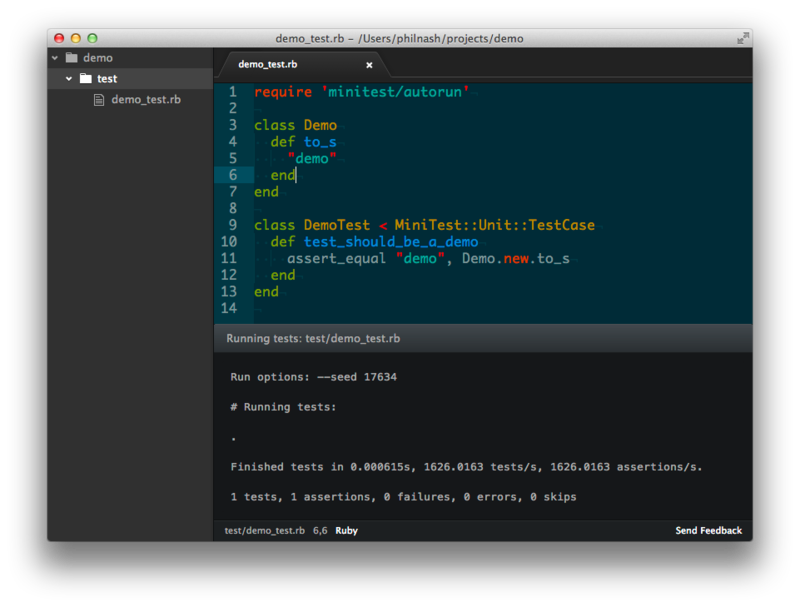 Inspired by Sublime Test Ruby-Test. Use the Atom package manager, which can be found in the Settings view or run apm install ruby-quick-test from the command line. Ruby Quick Test can be used to quickly run a test file with a file name that matches the pattern /_(test|spec)\.rb$/ or /.(feature)$/. Test files ending in _test.rb will be run using the ruby command, files ending _spec.rb will be run with the rspec command and files ending .feature will be run with the cucumber command. When the active editor is using such a file, you can run the tests with the key combination cmd-ctrl-t or by using the command palette (cmd-shift-p). This currently doesn’t cover MiniTest::Spec style files, but support is planned for those soon.